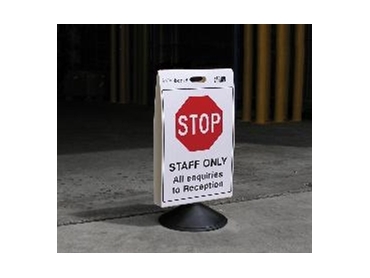 Barrier Security Products specialize in the area of portable warning signs with their top selling product the Info-Board portable warning signs. The Info-Board portable warning sign is a popular choice for warehouse, factory, car parks, cleaners, hospitality or outdoor workers to warn staff and customers of warnings with a choice of No Smoking, Slippery Surface, Forklifts in Use, Pedestrians Prohibited, Forklifts Prohibited, No Parking, No Entry, Cleaning in Progress. Info-board portable warning signs can also be custom printed with company logos or personalized warnings printed at an extra cost.